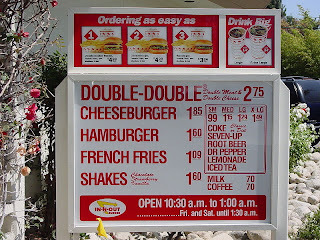 In N Out Burger is a fast food franchise unique to the West Coast. 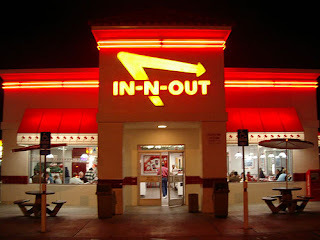 In the 11 years we lived in southern California, my hubby developed a strange fixation with In N Out. If there was an In N Out in the vicinity, he and his friends would go. He defined "vicinity" as being anywhere in a forty mile radius. When we moved to Nashville, my hubby grieved for two things: the ocean and In N Out. In N Out is a peculiar fast food restaurant. They have an extremely limited menu - no salads, no kid's meals, and no chicken of any kind. They are burgers, fries, shakes, and soda. And that's it. I never developed the same fascination as my hubby. I like their hamburgers well enough (I can hear my hubby and the entire West Coast In N Out cult screaming "Sacrilige" as I type this) but their shakes do nothing for me and I absolutely loathe their fries. The day after we arrived in California, my hubby took the kids over to Grandma's house and let me sleep a couple more hours - tucked in beside a now worn-out MAX. When he returned for me, I noticed something. He was fidgety. Pacing the kitchen. Glancing at the various offerings of fruit and cereal and then looking away. Checking the time. Checking the phone book, his eyes glazed over with the hunger only a true junky knows. "What are you looking for?" I asked, already knowing the answer. He flipped through the phone book again. "In N Out. There must be one somewhere. I saw a sign last night." Of course, I understood "somewhere" to mean "somewhere between here and Bakersfield, a scenic three hour drive away". "How could you see a sign when you were asleep in the car?" "Please." He looked at my with pity. I sigh. He's right. The spiritual connection he has with In N Out cannot be stopped by something as mundane as sleep. "Are we stopping there for lunch?" I asked because I am not afraid to ask stupid questions. "As soon as possible." He answered me and tossed the phone book onto the table in frustration. No In N Out was listed. In fact, on closer inspection, we realized many of the restaurants and shops seen on our way into town weren't listed. We checked the phone book cover. I spent a brief moment wondering why anyone would save a phone book from 1999. Perhaps MAX had eaten everything more recent. Not to be deterred, my hubby called a local friend of ours and explained his need. 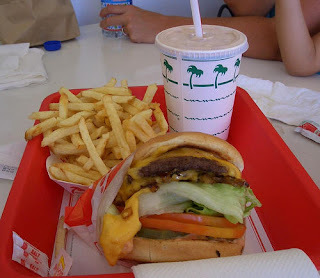 The friend (another man) was instantly onboard, giving directions, short cuts, and commiserating with the four years of forced In N Out abstinence my hubby had endured. We hopped in the car and headed to In N Out. As I mentioned before, their hamburgers are good - the grilled bun makes the difference, I think, but I'm sure I'd be voted down by all the true believers. Their shakes are decent but can't compare to, say, Johnny Rockets or Jack In The Box. But their fries - their fries are just nasty. When I unwisely voiced this reaction to my meal, my hubby earnestly explained that In N Out fries are special. They are not like other fries. "Yes," I agreed, "they aren't. Other fries are edible." 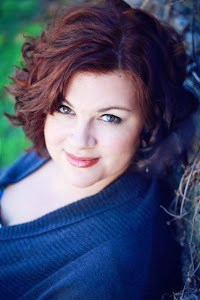 "Sacrilige," He thundered at me...well, okay, my hubby doesn't "thunder" but he did speak sternly. He then explained to me that In N Out makes their fries from actual potatoes. "And other restaurants are using what? Faux potatoes?" I ask. I am informed that In N Out has actual, whole potatoes on the premises and that they use a fancy machine to turn that potato into strips which are then dropped into the fryer. Nope, still tastes like I'm eating a chewy strip of nothing. My hubby is disappointed that knowledge of the process doesn't improve my opinion of the taste. On the night before he left, my hubby went out at 10:30 for one more In N Out run and came home with three paper hats decorated with the In N Out logo, ostensibly for the kids. I'm with Clint on this one. I love all their offerings - including their fries! And no offense, CJ - eating McDonald's fries make me think I'm eating imitation potato cooked in goo. Sorry. Kimmy - nobody said anything good about McDonald's fries. ;) I'm with you there. I would also like to add that the In and Out shakes are make with real ice cream. Unlike your JITB who-knows-what-preservative-nastiness shakes. JITB uses real ice cream too. So does Sonic. And Steak N Shake. I like all three of them better than In N Out. As a true ice cream lover, I understand that there are many LEVELS of real ice cream. There's the store brand variety and then there's Bryers. So Grayback, she's standing over you with a knife? It's genetics, as you should remember !! !